This issue of FormAkademisk features selected articles developed from papers presented at the Make it NOW! 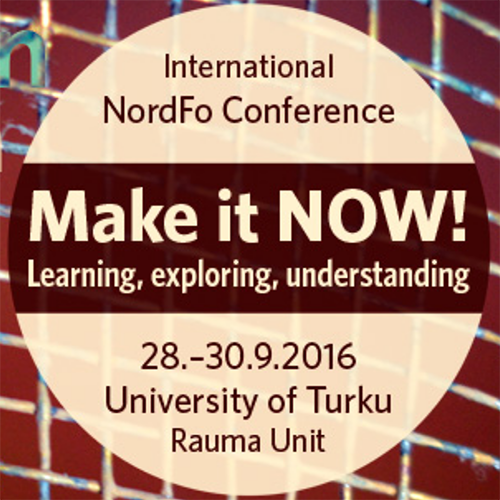 Learning, Exploring and Understanding conference in Rauma, Finland, September 28-30, 2016. This NordFo conference was organized by Rauma Unit of Turku University´s Department of Teacher Education. NordFo is a Nordic forum, supported by NordPlus, which since the 1980s has worked towards initiating, stimulating and reporting research and development work within the subject art and craft, textile work and woodwork and the teacher education in these subjects in the Nordic countries. The conference Make it NOW! aimed to “…provide an arena for discussions on craft, design and technology as an innovative combination of knowledge and skills related to eco-social values in altering the world according to human needs and wants” (International NordFo Conference in Rauma, 2016). This special issue of FormAkademisk called for articles with an emphasis on the theme Researching embodied making and learning – New methodological vistas on Making, however this did not exclude papers from other sessions. Additionally, this issue contains two other, independent articles that fit this special issue’s scope.